Reminiscent of The Maltese Falcon, Bill Capron’s novel opens with the alluring damsel in distress sauntering into an unsuspecting private investigator’s office. She entices him with the proposition of recovering her dead husband’s millions by locating the person who has stolen the key to his safe deposit box. 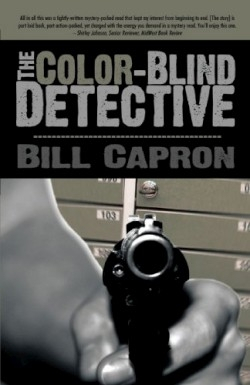 This hard-boiled detective novel is a good debut for author Bill Capron. His protagonist is private detective C.B. Green, who has no apparent character flaws. He’s a likeable hero with a conscience and morals, a lone wolf without a romantic interest, focused only on his clients. He’s such a nice guy that he bails out his flighty ex-wife and takes on clients without them even asking—like the seventeen-year old girl who dies in his arms after being shot. His motivation for street justice originates from the accidental death of his former girlfriend Rhonda, gunned down on the street by a jewelry store robber fleeing the police. Rhonda’s death made him a victim, and now he feels compelled to see that criminals are brought to justice, especially when loopholes in the laws work to the criminals’ favor. But Green’s form of justice isn’t vigilante justice—it’s an indirect means of righteousness that turns evil on itself and enables the bad guys to trip themselves up. “I create an environment…where, if they are guilty, justice will play out to its logical conclusion,” he says. Green’s color-blindness isn’t germane to the plot, but it’s used as a filter to portray how Green sees the world—with stark contracts between black and white, and the lack of color distinction appearing as gray in-between. As he describes it, “My black and white world is bleaker, sharper, more defined. There is more information available to the eyes once the color is stripped away.” The black and white theme is repeated throughout the novel, with references such as the black and white photos on Green’s office wall and the struggle between good and evil. The interweaving of Green’s cases works well without seeming contrived, and his characters are interesting. Including a list of characters at the beginning is unnecessary because the plot isn’t complex enough to cause confusion over characters, yet it is not too simple or predictable. Capron’s writing flows smoothly, the witty repartee between the characters adds to the interest, and short chapters provide effective plot transitions.